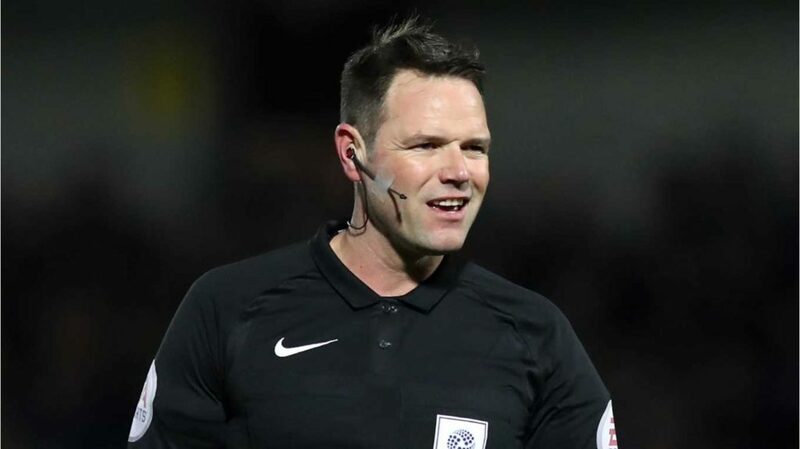 This week’s referee spotlight focuses on James Linington, who was appointed the referee for the Swansea City v Stoke City Championship game on Tuesday, 9 April 2019. Referee Linington was assisted by Mark Pottage and Adam Matthews, with Brett Huxtable the 4th Official for the game. James Linington can claim to be a referee for whom every match in the EFL is an overseas appointment, as it requires a journey from his home on the Isle of Wight! Linington started referring in the Football League in October 2008, taking charge of the Yeovil Town v Crewe League One game. The first game he officiated in the Championship was Watford v Burnley in January 2009. Some Swans fans will probably remember James Linington from when he sent off three (yes three!) Swans players during a League Cup game against Scunthorpe in August 2009. Garry Monk, Gorka Pintado and Angel Rangel, were all given their marching orders in a farcical game that saw the Swans lose 2-1 after extra time. Stephen Dobbie went off injured, with the Swans having no substitutions left. The Swans were then reduced to six players when Besian Idrizaj went off injured, with referee Linnington accused of forcing the Austrian back onto the pitch in order to avoid abandoning the game, leaving Swans boss Paulo Sousa fuming.